In the year 12,090 AD, the Earth has fallen into the clutches of ruthless vampires and humans are enslaved by a corrupted feudal system, prey to a mockery of freedom and justice. Only one being has dared to challenge the cruel authority of these vicious, arrogant immortals - the mysterious vampire hunter called "D". 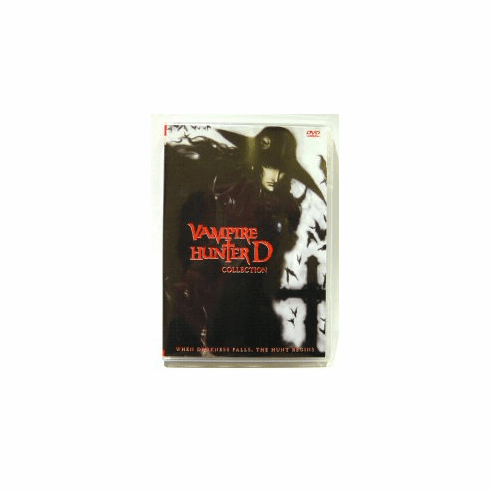 Cult classic by any standard, the sophisticated blend of horro and futurestic science fiction distinguishes Vampire Hunter D as a strikingly original gothic thriller. The darkly fantastic immagery and exotic chracters help to fully realize the potecy of the film, confirming its stutus as an exceptional accomplishment in animation. D has been hired to track down Meier Link, a notoriously powerful vampire who has abducted a Human woman, Charlotte Elbourne. D's orders are strict - find Charlotte, at any cost. For the first time, D faces serious competition. The Markus Brothers, a family of Vampire Hunters, were hired for the same bounty. D must intercept Meier and conquer hostile forces on all sides in a deadly race against time. Deposed by Vampires for his profession an by Human for the blood in his veins, D relentlessly pursues his prey for a price.